Pro-Line Contest Reminder! « Big Squid RC – RC Car and Truck News, Reviews, Videos, and More! So here’s the deal, we have the following awesome prize package! 1 Flo-Tek Chevy Silverado 1500 Body! And of course a ton of Big Squid RC stickers to cover that body and all your other rides. Now if you were paying attention, I mentioned ‘Possible Custom Surprise Body’ in the contest name.. so we were thinking, we will give the winner of the contest the choice, they can take the body clear, OR let one of our guys paint up a custom one for you. You will have NO SAY in how we paint it, or how we customize it. Maybe we let Manny, our uber scale guy whip something up, or maybe we will let Cubby have at it with crayons and markers. It may get murdered out, or come in a nice shade of pink. It’s a risk you will have to take. 🙂 I honestly hope the winner is brave enough. So how do you enter? We are going to mix this one up a little bit. You need to LIKE THIS POST ON FACEBOOK, and LEAVE A COMMENT on the Big Squid Facebook Page. That’s it! We are going to open this contest up to the US and Canada only. Sorry to all the people that are not here in the North America, but it would cost more to ship it than if you just bought it local. You have till Friday, September 14th 2012 (8pm cst) to enter! We will then draw a winner and post it up at 10pm cst. Please, only 1 entry per person. Special thanks to Pro-Line Racing for helping out on this one. 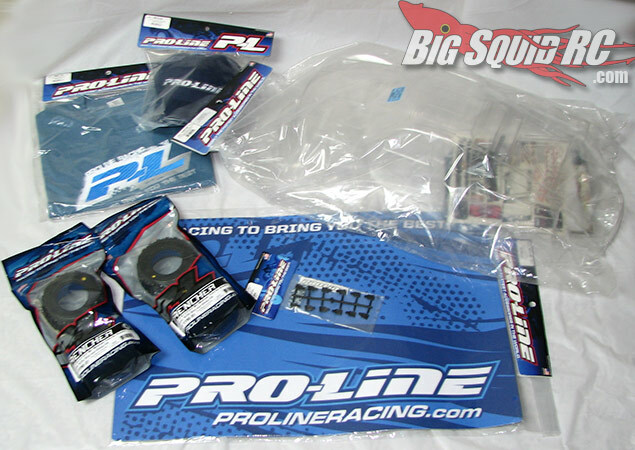 While your at it, go LIKE the Pro-Line Facebook Page as well, as a way of saying thanks for their support to Big Squid RC! Again.. go to our Big Squid Facebook Page like the Facebook post, leave a Facebook comment, live in the USA or Canada, and keep your fingers crossed!